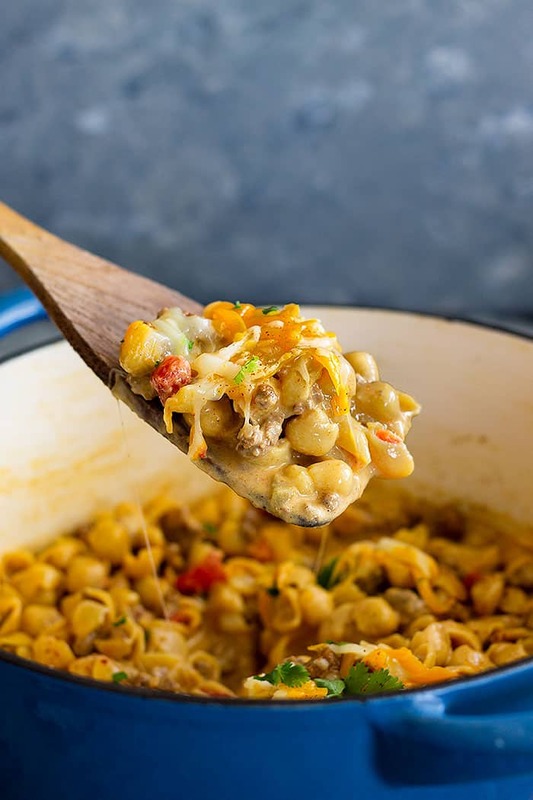 Chile Con Queso Mac and Cheese is a great one pot meal for any night of the week! It’s quick and easy (only takes 30 minutes), cheesy, and will become a family favorite! I have been wanting to redo these pictures for a very long time now! I make this often (almost as much as Homemade Hamburger Helper!) and the pictures needed some help!! 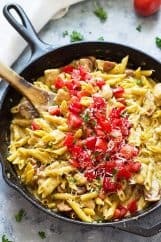 This is a great weeknight meal that’s made all in one pot and only takes 30 minutes to make! Some other great weeknight meals that take 30 minutes or less are: Spicy Chicken Tacos, Chicken in Garlic Mushroom Cream Sauce, or this Easy Taco Soup. 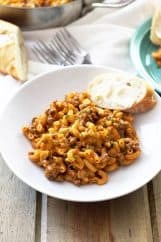 I love easy dinner recipes with ground beef! They are perfect for busy weeknights when you need something fast! Which is pretty much every night if you live in my house! Since it’s summer we have been living outside soaking up the rays before it gets too hot to be out and before I know it 7 o’clock hits and I need to feed my kids fast! You know…. when everyone is hangry and hanging on your shirt begging for food. 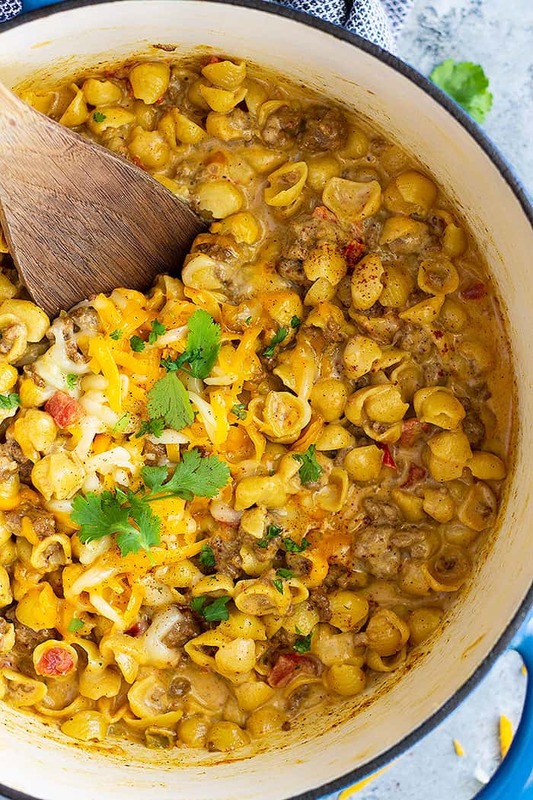 Can I freeze Chile Con Queso Mac and Cheese? 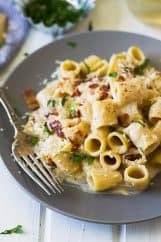 This does make a large batch of macaroni and cheese and it is great for leftovers the next day too. But if you don’t want to keep it in the fridge just place it in a freezer safe container and freeze for up to 2 months. Then just thaw overnight in the refrigerator and reheat as needed. 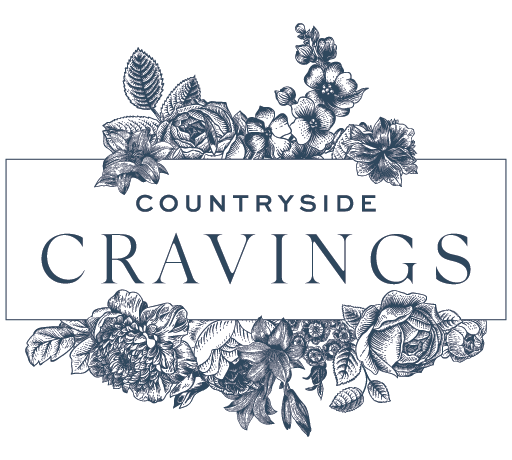 What to serve with Chile Con Queso Mac and Cheese? 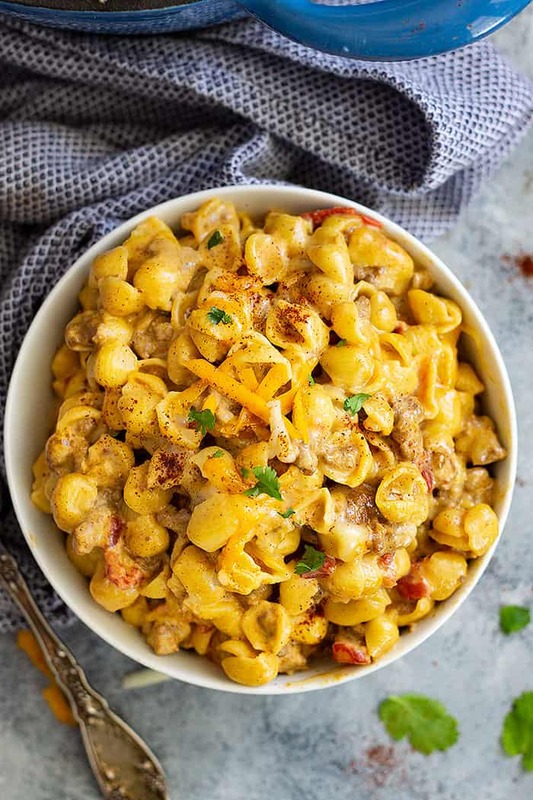 Chile Con Queso Mac and Cheese -is a great one pot meal for any night of the week! 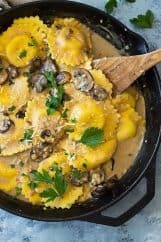 It's quick and easy (only takes 30 minutes), cheesy, and will become a family favorite! In a large dutch oven brown ground beef with onion and jalapenos. Add in garlic and cook until fragrant. Drain any excess grease. Add in macaroni, broth, milk, tomatoes, chili powder, cumin, salt and pepper. Bring to a boil then reduce heat. Cover and simmer for 10 minutes or until pasta is tender; stirring occasionally. Remove from heat and stir in cheeses and sour cream. Store leftovers for up to 5 days in the refrigerator. 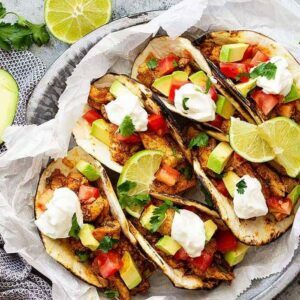 You can replace the jalapeno and can of diced tomatoes with a can of rotel (diced tomatoes and chiles) or use a can of green chiles to replace the jalapeno. Freezer Friendly option- can place in a freezer safe container and freeze for up to 2 months. Nutrition info calculated using regular sour cream. Craving all the cheesy deliciousness of this macaroni and cheese right now.. it looks so flavoursome and comforting! Thank you so much for the pin!! I just made this today. Soo cheesy and flavorful.. I can’t stop eating it! And it was easy to make! Thank you! Will be making again! I am so pleased you enjoyed this!!! Thank you for your comment! My children called this a taste of heaven !!! It was absolutely delicious…thanks for the recipe. Why thank you!! Kids can say the best things and it made my day to read your comment!! This is good. will have to make again soon. Thanks Grandma, glad you liked it!! 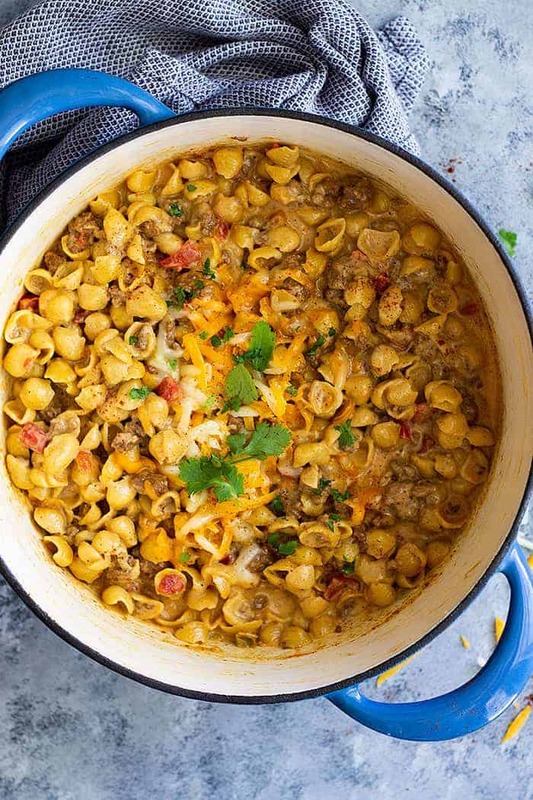 Love this one pot meal and I’m sure it’s one that everyone will love! What a great twist on regular Mac & Cheese!!! Can’t wait to try this one out! This looks amazing! Totally adding it to the menu!